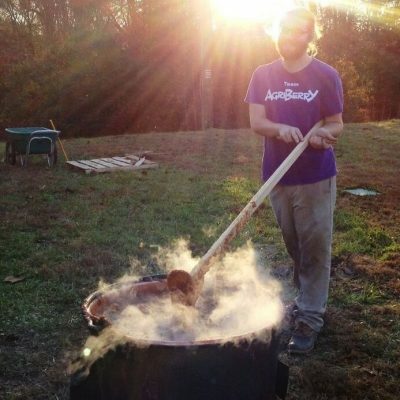 Agriberry Farm is owned and operated by the Geyer family in Hanover, Va. The farm specializes in growing blackberries, raspberries and other fruit in their Central Virginia fields. Founded in 2008 the farm is the vision-made-real of Anne and Chuck, and they are supported by their friends, neighbors and community. Above all, the Geyer Family is committed to helping to increase the consumption of locally grown fruit and berries in Virginia and Maryland, and they are especially proud to be able to help young area workers gain initial work experience and an appreciation of agriculture, both as a career option and community resource. Anne Frackelton Geyer is the spark that launched and continues to inspire Agriberry Farm and the Geyer family. Anne operates Agriberry Farm along with her husband Chuck Geyer, her son Pierson Geyer, and daughter Colleen Geyer, along with help from her sisters Susan and Molly. She wants the world to “Eat More Berries,” due to their high nutritional value and health benefits. Furthermore, Anne deeply believes that every young person benefits from the chance to work on a farm. Those ideas converged with the founding of Agriberry Farm in Hanover County in 2008, and they still guide the farm today. Anne is a graduate of Wells College in Aurora, New York. 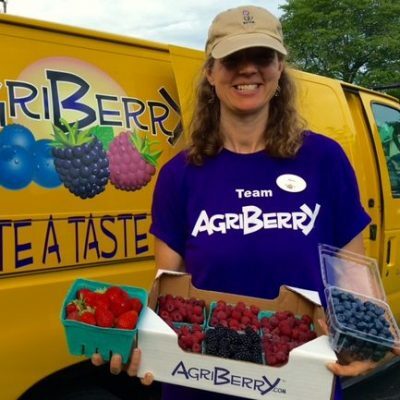 She grew up in the Finger Lakes region of New York, and her summer adventures picking and eating wild black raspberries with her siblings helped shape Anne’s desire to grow cane berries on Agriberry Farm. “Farmer Chuck” knows fruit growing with a depth and intensity few can match. He hand-prunes and hand-harvests the fruit from each of the peach, cherry, plum and apple trees in the farm orchard. As the Geyer family patriarch and the farm’s IPM (Integrated Pest Management) lead, he works closely with the harvest and plant care team to ensure that the fruit, workers and consumers stay healthy and safe. A natural engineer, he keeps all the farm equipment and infrastructure running, and he represents the farm at the Charlottesville City Market every Saturday in season. Chuck grew up on a dairy farm in Upstate New York, and has a bachelors degree in Agriculture from Delaware Valley College in Doyleston, Pennsylvania, and he also is an active member of many regional and national fruit and berry-growing organizations. They say apples don’t fall far from their trees, and that is surely true of Pierson Geyer, because he has inherited such a love of farming from Anne and Chuck. Being the farm’s General Manager gives him an active role in all aspects of the farm, including the markets and CSA. In addition, he oversees the harvest, including the hiring and training of seasonal workers each season. Further, he is responsible for maintaining the farm’s GAP certification and compliance (Good Agriculture Practices, as established by the USDA.) On Sundays he and sister Colleen can be found at the fast-paced Baltimore Farmers’ Market & Bazaar. Pierson’s exceptional talents are recognized on and off the farm, as is evidenced by his recent selection by the peer-nominated “40 Under 40” Class of 2018 list of national leaders in agriculture. This recognition is due in part to his role as the youngest-ever president of the North American Raspberry and Blackberry Association (NARBA.) Pierson also participates in many local and regional programs, including support for emerging farmers in conjunction with the College of Agriculture at Virginia State University. 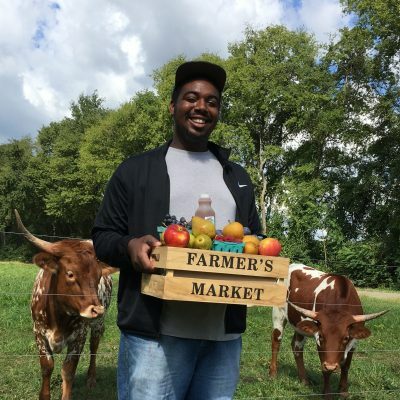 Pierson has a Bachelor’s and Master’s degree in Education from Virginia Commonwealth University, and he uses his skills daily in the office and in the fields to help grow the Geyer Family farm. Colleen is Kitchen Manager for Agriberry Farm. She and her twin sister Mary Claire grew up helping out in the fields, in the kitchen and at markets, so she was steeped in the joy of fresh food, extended family gatherings, and hard work. In her newly defined role overseeing the farm’s busy certified commercial kitchen, Colleen is responsible for overseeing the recipes, procedures and production of the farm’s jams and other jarred items, baked goods, frozen fruit and other pantry staples. She can also be found at the Sunday morning Baltimore Farmers Market & Bazaar alongside brother Pierson. With her passion for cooking obvious from an early age, Colleen earned a Bachelor’s degree in Culinary Arts from Johnson and Wales University in Providence, R.I., and she pursued advanced internships in the U.S. and France in Pastry and Baking. She has launched her own business, River City Bakery, and is participating weekly at the Tuesday afternoon Birdhouse Market in downtown Richmond, and the new lunchtime OntheSquare Farmers Market in Richmond’s Capitol Square. Colleen is an avid wellness fan, with a compelling “backstory” regarding weight loss through good nutrition and exercise. Colleen is also a certified “BodyPump” instructor, and she loves distance cycling and running, and playing with her dog Aurora. Mary Claire Geyer farms in the Pacific Northwest. She breeds and shears her own flock of Icelandic Sheep, and works at other area farms. She is learning to train cutting horses, enjoys fiber arts, and is passionate about heritage food and low-impact living. She loves her current digs, but knows there’s a spot for her in Virginia when she’s ready. 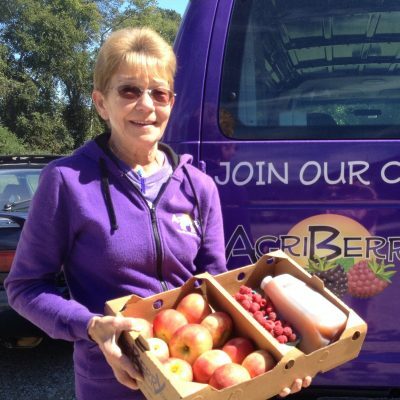 Anne’s sister Susan coordinates the Annapolis area CSA for Agriberry Farm. 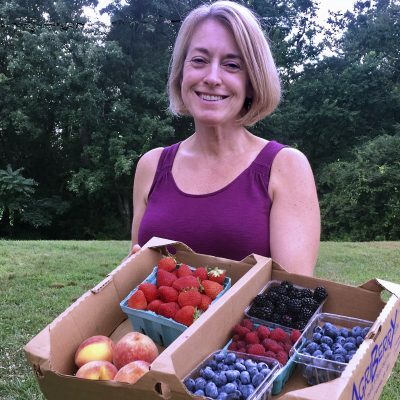 As a personal trainer at the Annapolis Athletic Club, Susan knew her friends, clients and neighbors were more than ready for the health benefits of berries and fruit from Agriberry Farm. Susan and her husband Robert visit the farm often and help with planting and other projects and special events. Molly, Anne’s youngest sister, keeps the books for Agriberry Farm. Molly is known to be Berry Sweet by all who meet her. Ellen is Anne’s niece, and she has been helping at the farm since she was in middle school. 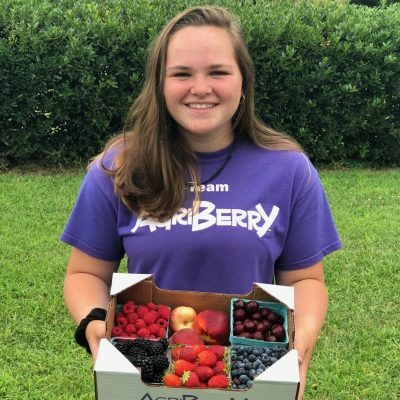 Now that she and her husband Will are raising their family in Williamsburg, they represent Agriberry Farm at the Williamsburg Farmers Market every Saturday during the harvest season. When their schedules permit, the offer the Agriberry Farm CSA in the Williamsburg area. Ellen teaches reading at a Williamsburg area elementary school, and Will works for the College of William and Mary, while they raise their two sons, Johnny and James. In addition to the Geyer family, Agriberry Farm employs a number of dedicated CSA members and neighbors to help keep the fruit rolling each season. Here are some faces you may find familiar. Charlie is the Warehouse Manager for Agriberry Farm. He ensures that the fruit for markets and customers are ready each day and that all the vehicles are properly stocked. 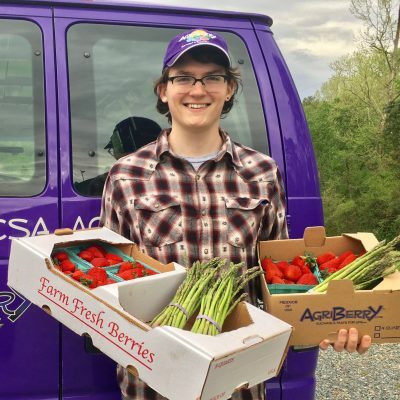 His good nature, enthusiasm for learning, and commitment to customer service make him a great fit with Agriberry Farm. He also helps out at the Market at St. Stephen’s. In his spare time, he’s a musician. Ethan is a key, multi-year Field Crew member and is game for special projects year-round. Mariah, a Hanover native, is a Maggie Walker Dragon by day, and hard working Harvest Team member and Market site leader in her “spare” time. We love her dynamic approach to life and fruit! Where would we BEE without our bees? 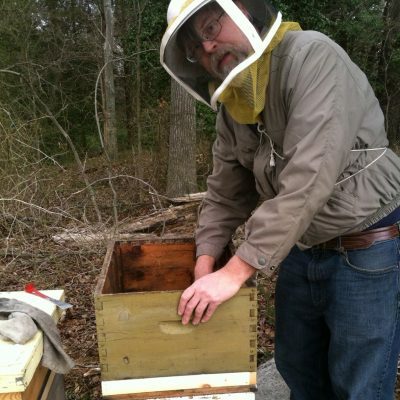 Robert often joins us for farm events, and makes his honey available for sale depending on hive and harvest conditions. Bridget is the CSA Coordinator and Market Lead for the Richmond area. She also helps in the farm office, in the kitchen and at many markets each week. Bridget began as a Harvest Team worker in 2014, and soon became a year-round contributor and Lead Picker, and Assistant Field Supervisor. She also helps coordinate Social Media for the farm. 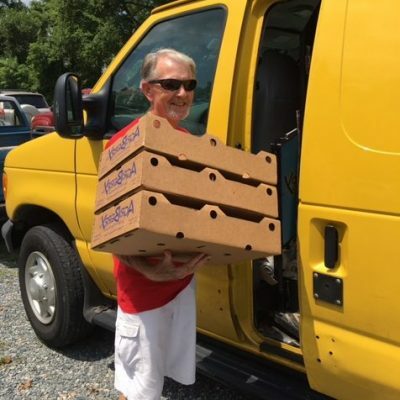 Ed takes care of CSA and Market customers for the Geyer Family at the Atlee Farm Stand and the Huguenot-Robious Market. Quality is Job One for Ed, who is a Charter CSA member of the farm. A native of Waynesboro, Ed and his wife have lived in Hanover for more than 40 years. Among his many many interest are caning and woodworking, roots music and being the best grand-dad ever. Amy helps out Geyer family with research, projects, markets and more. Her special talents include her Master Gardener status and culinary commitment to healthy eating. And, ask her about the role of essential oils in health and wellness. Maria, who grew up on a farm in Iowa, helps out at markets and also helps with special youth-oriented projects. 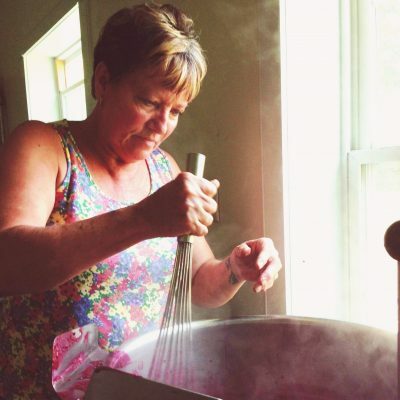 Julia has worked with the Geyer family for more than 20 years, and she makes almost all the jam for the farm and makes many of the baked goods for the farm’s markets. She also helps in the Warehouse, where she packs fruit and make CSA shares. Her strawberry shortcakes, evolved from a recipe from Chuck’s mother, are the stuff of legend. Rose has worked with the Geyer Family for more than 20 years, including previous roles as Warehouse Manager and other mainstay positions. She is Berry Loved by all at the farm! 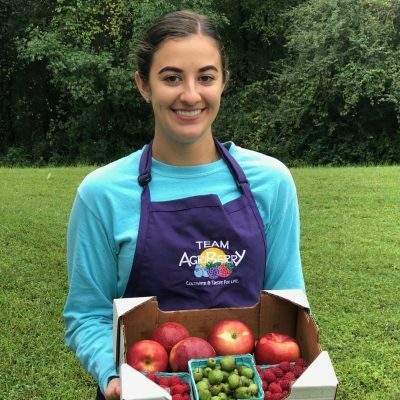 Shannon is a Hanover native and a farm neighbor who has been working for Agriberry Farm since she turned 15 as a Harvest Team member and now helping at markets and CSA sites through the year. Montana, a farm neighbor and the daughter of a CSA-member family, has been working for Agriberry Farm since she turned 14. Her sweet smile and hard work make her a favorite of staff and customers alike. 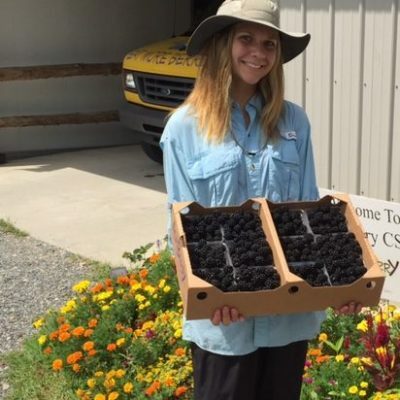 Montana attends Appalachian State University and is pursuing a degree in nutrition and community food systems….Way to GROW, Montana!! 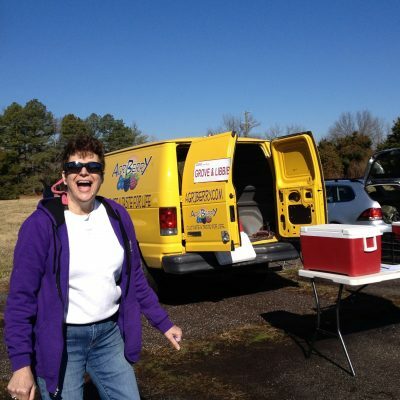 Adriane helps with deliveries, markets and CSA sites year-round, holding court weekly at the Birdhouse Farmers Market on Tuesday afternoons, and Lakeside Farmers’ Market on Saturday mornings. He is the friendliest guy we know, and always has a compliment or a smile for his customers and co-workers. 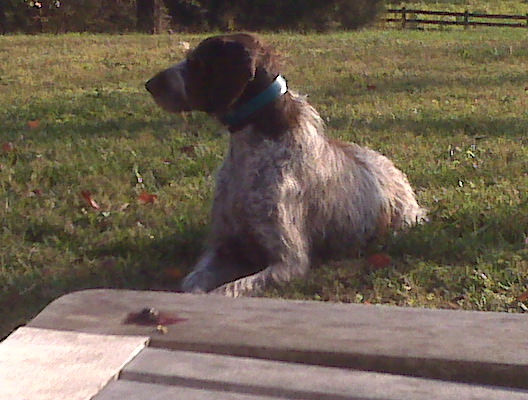 Another member of the “Studley Neighbor Gang,” Billy has helped with many aspects of the farm. He has done deliveries, helped at markets and he’s also one of the only people Chuck trusts on his mower to keep the grounds at the Woodberry Farm looking spiffy. 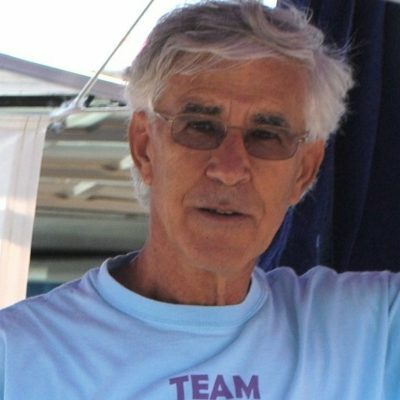 Billy’s warm heart and careful efforts make him a valued team member and neighbor. 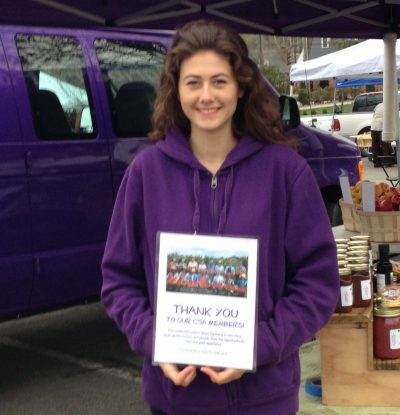 Ruth began helping at farmers markets and as member of the Harvest Team. She also helps out in the farm office and is a farm neighbor. Marjorie helps with the website and fills in at markets. She began her connection with the farm as a CSA member and neighbor, and has helped the Geyer family in many roles, including jam making, warehouse work, at markets, as CSA coordinator, and with the farm’s website.